"He's got a way to go. I mean he hasn't achieved all of his purposes, but he's stabilized the economy. … Whether you approve of health care or not, he took on that challenge, which is a major issue for the American people. … I think he has reached out to countries around the world and has developed good relations. … He's working very hard on the issue of unemployment, which I think is the major problem facing America right now and I hope this will be the centerpiece of the state of the union speech." "We didn't elect Superman, we elected a human being — Barack Obama — who came in with an idea, with energy, and I think with a more youthful approach to things. That has been proven useful where we see more countries helping us out in places like Afghanistan, where we see people who want to work with us climate change and other issues, where we see the invigoration of the G20 as a new economic forum in which to do things. So I think yes, there have been improvements, but at the same time we could not expect everything to improve for the better, all at once, just because a new personality came on the scene." 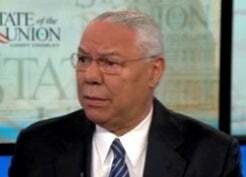 However, the part of the interview with CNN's Candy Crowley that made headlines was Powell's refusal to endorse President Obama — or any candidate, for that matter, for 2012. He told Crowley he had to see all the candidates first before deciding, but for now, "I'm not committed to Barack Obama. I'm not committed to a Republican candidate." See more of Powell's CNN interview below.